The #1 Bodybuilding Cookbook On The Market! If you are a bodybuilder or weight lifter trying to gain muscle mass or shed body fat the Anabolic Cooking Cookbook by Dave Ruel is by far the #1 bodybuilding cookbook on the market today. It is jam packed with 100′s of easy to prepare and delicious tasting high protein anabolic meals, post workout shakes and more! Check out my video review below to learn more about this fantastic bodybuilding cookbook! Click Here To Visit The Official Anabolic Cooking Page Now! 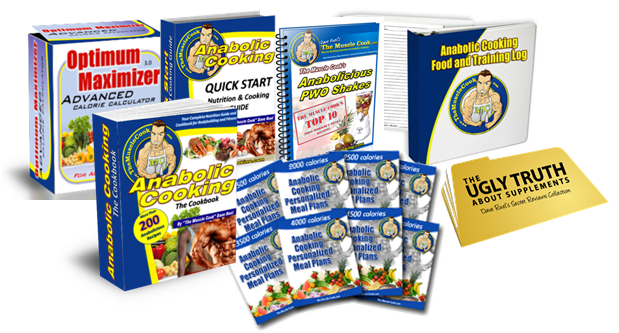 Below I have listed a recipe from the Anabolic Cooking Cookbook you can print out and try so you can get an idea of the types of foods that you can prepare from the recipes in the book. As you can see from the sample below this is not your typical plain oatmeal breakfast type of recipe that so many other bodybuilding diet books tell you to eat but real good and hearty foods that will help you build muscle mass and shed fat fast! If the high protein pancakes sound good look at the additional high protein breakfast recipes you get with your purchase of Anabolic Cooking! All the recipes that you will get will have lots of variety and the dinner and side items are just plain awesome! If I had to make one complaint about the book it would be that a lot of the recipes list Splenda as an ingredient. Splenda is nothing more then a man made chemical sweetener that I feel is not healthy to eat long term. I would have preferred that Dave list Stevia as a sweetener as this plant based sweetener has no calories but is 100% natural and much better for your body! But that is something that you can change on your own so its not a very big deal but one I felt was worth mentioning! The biggest thing that i liked about Dave Ruels Anabolic Cooking Cookbook is that not only did the recipes taste really good but they also were easy to make and there were a TON of them! Dave also makes it simple and breaks them down in to groups so you can make your selections real fast. In addition the included meal planner and calorie calculator make achieving your goals much simpler! What i liked about each of these recipes is that each one lays out really simply the ingredients you will need, the nutritional analysis (calories, Fat, Protein and Carbs amount of servings) of each recipe and a step by step guide to making each one. Fret not though because all of these recipes are really easy to make and so easy that any of us guys can quickly make them with no problems! When You purchase The Anabolic Cook Book By Dave Ruel you not only get the 186 page Muscle building cookbook you also get a bunch of bonus products all designed to help you eat better, train smarter and pack on more lean muscle while shedding fat! The bonus products are very valuable resources and will definitely give you the upper edge you need from your training and nutrition! So there you have it you get a total of 206 easy to make great tasting low fat high protein muscle building recipes. You could literally eat a different thing for every day of the month and never get bored or eat the same thing twice! And to make it better you get lifetime updates so you never have to search for anabolic recipes again! So Buy The Anabolic Cookbook and start giving your body the protein, carbs and low fat it needs to pack on muscle, get stronger and most importantly get ripped! 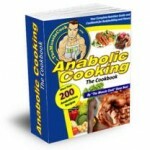 You Can Try Anabolic Cooking At No Risk! Combine all of the above benefits with the fact that Dave Ruels gives you a 60 day satisfaction guarantee on your purchase! So if for whatever reason you are unhappy with your purchase of Anabolic Cooking you can simply ask for a refund and get your money back. But I know that once you see the recipes and taste them and then see the effects they have on your body you will be totally satisfied with Dave Ruels Anabolic Cooking Cook Book! 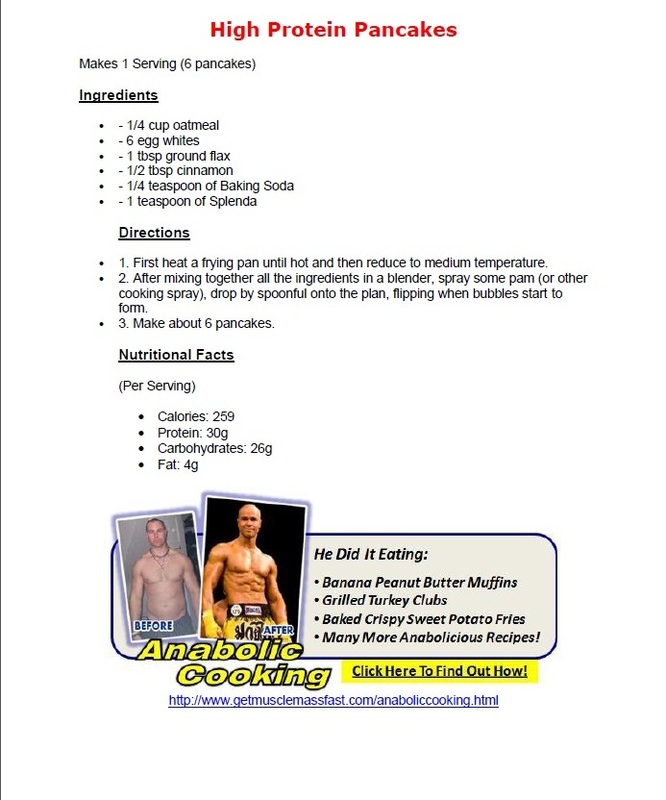 Click Here To Download Dave Ruels Anabolic Cooking Cookbook Now!